The price of WTI Crude Oil extended losses on Monday after Friday’s rejection of a retest of the current yearly highs. 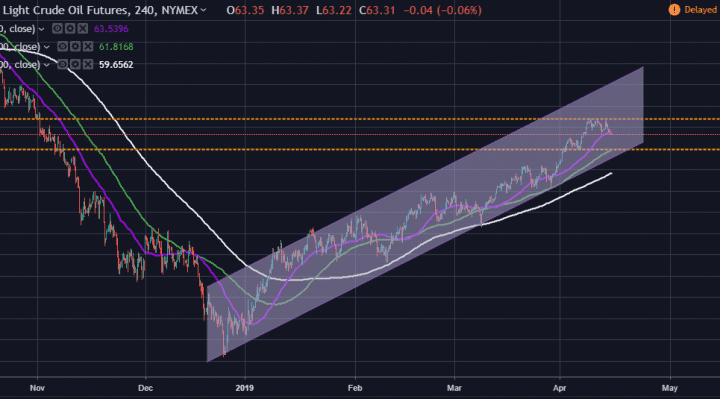 Early last week, the price of WTI Crude Oil rallied to trade at $64.79, which is the highest level reached in 2019. However, the rally could not be maintained throughout the week with the price of oil pulling back late on Friday to close the week at about $63.76. And on Monday, this decline continued with Oil edging downwards towards the $63.22 level per barrel. The price of Oil dropped on Monday to momentarily test $63 following a series of mixed signals about global supply. With the US demand for crude products continuing to rise, the WTI Crude Oil will continue to experience stable price with steady gains. Furthermore, the ongoing turmoil in Venezuela coupled with the news that Saudi Arabia won’t be exporting oil to the US also adds to the catalysts for the crude oil price to rise. As such, even with the latest reports suggesting that production could spike in the coming months in some regions, there is still a strong base for stable oil prices in the foreseeable future. 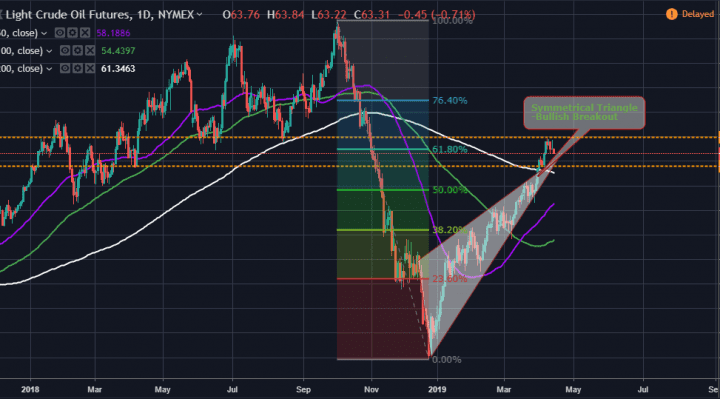 Technically, the price of WTI Crude Oil has been oscillating within an ascending channel since late December 2018, and this trend is seen continuing to the foreseeable future especially when you blend in the technicals with the fundamentals overview. As such, given the latest pullback, the bulls will be looking for opportunities around the $64.77 price level while the bears will hope the pullback continues by targeting profits at around $61.90, which coincides with the 100-period moving average. In the daily chart, the price of Crude Oil appears to have recently broken out following the formation of an ascending symmetrical triangle. The price is now hugging the 61.80% Fib level, just below, which suggest that there could be a short-term consolidation around the current price level of $63.38. Therefore, this again supports a short-term bullish target of $64.90 while the bears will also be optimistic and could target $61.97 for profits. In summary, the price of WTI Crude oil appears to have made a significant pullback following last week’s rally that led to a new yearly high. Nonetheless, both the bulls and the bears will be optimistic as we start a new week.